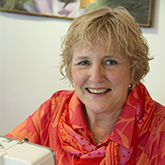 Nina McVeigh is a BERNINA Educator with a focus on quilting and longarm quilting. She travels and teaches around the country. She has sewn for as long as she can remember and is passionate about all types of sewing. She has fallen in love with long arm quilting. When not sewing or quilting she likes to read and play the guitar.